Kayak.in is quite a new site for India and people from this continent, and cleratrip.com for others. But both the sites are very similar in look & feel and even in user experience however revenue models are different. Kayak has left site navigation and cleartrip have top navigation. Kayak’s US site is having eight links at and Indian version have only three as they are not dealing in may traveling/holiday products. Cleartrip is also not having list of links, just have only four links. In US version of kayak when you click on particular link the site color also changes along with the logo color. It is good from user point of view as it is showing that particular link is active. I don’t understand why they are changing logo color; in fact people try to stick on brand colors in any situation. Color changing is not taking place in kayak.in and even in cleartrip. Form for searching is almost similar in all the sits and act in same way except one feature which in not in cleartrip. (I am comparing “Flight” link as it is common in all tree). When you start felling the form in kayak and feel the “from” and “to” fields and move to depart date a chart/calendar get appear next to the search showing “best fare”. 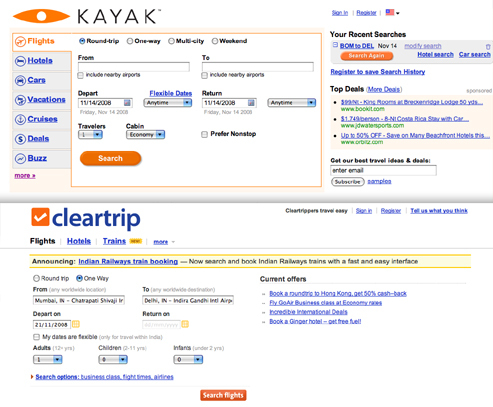 Search process is faster in cleartrip then kayak, may be because they are fetching data different way or different type. The result page is again similar in many ways. Primarily Page is divided in to 2 parts, left filters and then results. Kayak has one more part next to results and it is space for advertisements. Let of the page shows filters to refine your search and interestingly they are similar (it is possible, they are in same industry). Cleartrip filter panel stick on place when you scroll the page vertically. Result section in cleartrip is very clear and shows the results to the point without any confusion. Kayak is trying to show results by two ways “list view” and “matrix view” with some filter options. When you choose some flight its redirects you the airline site, opposite to this cleartrip book your ticket keeping you with the site. As I am comparing the both cleartrip and kayak for resemblances and not reviewing, I am skipping all other features which are unique. Even in this process I may fail to mention some fascinating characteristic, please share the same along with your views.